ABOVE CU 73 Pink Field Landscape 22 cms h.
LEFT CU 74 Morning Landscape 22 cms h.
A predominant influence in this work is the landscape, but not a static landscape, instead a landscape in time; where things grow, the land moves, geological deposits are built up and most importantly where the repetitive, methodic actions of mankind have left lasting visual effects on the environment. Conversely I am also influenced by manmade environments and constructions that have been eroded or transformed through time by the natural forces of sea, wind, rain, frost or sun. This work is about places and landscapes I has visited or travelled through, but I want to avoid extraneous descriptive detail in my work, instead things are pared down to express the spirit and essence of place and time. In each piece that I make I have endeavoured to create a balance between forms that are man made and those that are naturally created. Some edges for example have an eroded, random feel while others are straight and angular appearing man made rather than naturally formed. 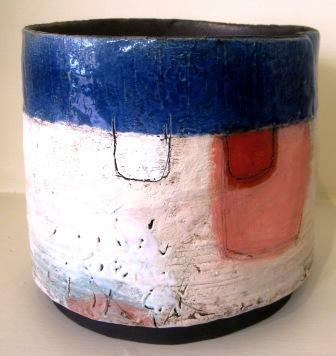 Surfaces meanwhile are build up of layers of colour and engobe that are painted and over painted, fired and refired, working all the time as a painter applying paint rather than a potter glazing a pot. Marks that are often applied in rows or grids give a subtle sense of order to the work and suggest landscapes mentioned earlier, where a repetitive action that has taken place over time has left a physical record. Concentrated areas of marks are often surrounded by large areas of white space that has a subtle depth and texture to it. The contrast between these areas of white space and finer more detailed marks is used to give an impression of grander scale to a piece. This work shows a subtle palette of colour with an extensive range of textural surfaces that is complemented by an in depth understanding of mark making. Applying colour, texture, and marks to the surface is the most eagerly awaited part of the making process. Before a piece is produced the composition of the work as a whole must be considered. The initial form, colour, marks, textures and so on are explored through drawings and paintings so that when the piece is constructed and the marks are applied to the surface there is a basic plan to work from. At this developmental stage my awareness and practising interest in other art forms and media (especially drawing and painting) helps to inform my ideas for ceramic pieces. However the action of mark making and applying engobe and slip is spontaneous and intuitive, always allowing for some accidental effects and chance occurrences to take place. The constant exploration and investigation of materials, mark making, and the integration of surface with form is an important factor in the production of this work. For me the fascination of making work is the discovery of finding new ways to express ideas and feelings that couldn’t be expressed in any other way.